Imagine playing blackjack being dealt by a real dealer, using real cards…not at a casino, but from your PC. This is the essence of a new (ish)blackjack offering referred to as live blackjack, live dealer blackjack, or live online blackjack. The dealer is located in either a real casino or purpose built studio somewhere. They deal a game of blackjack using real cards in front of a web cam that streams live vision of the deal to your computer, along with an accompanying bet interface that allows you to bet to that deal and depending on the casino, maybe also chat with the dealer and other game players. A typical game interface is shown in the image at right. Inset into the game screen is the live video showing the progress of the real-card and deal. This will usually also be replicated in virtual form on a surrounding table graphic, allowing for clear view of the cards and placement of bets etc. Most live blackjack games are played in multi-player format. That is, you join the game by taking a seat (if available) at one of the 7 available at the table. Hands are then played in turn as they would be in a normal casino. Multiplayer live blackjack is more common than single player live blackjack and more closely replicates the game format played in a real casino. Single player, or rather single player-deal games are faster as only one player hand is dealt. While you still play your own hand, because there is only a single ‘player’ hand deal the deal convention is slightly different with additional cards dealt to the middle of the table to cater for different player hit, stand etc decisions. 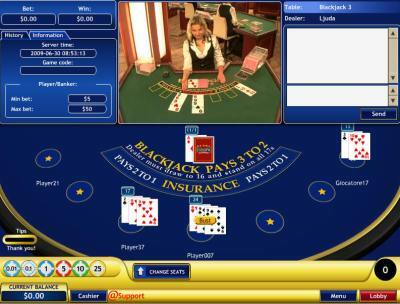 Another key distinguishing feature of available live blackjack games, is the location where the game is streamed from. While most games are streamed from purpose built dealer studios, a notable few are streamed from actual bricks and mortar casinos in which normal game play (ie people sitting at the tables inside the casino) is also taking place. Presently one platform provider offers this type of video stream, but their game is a variation know as early payout live blackjack. Live blackjack is relatively new and evolving, so the number of casinos offering it and the number of variations on offer is still limited. But if you are a fan of the game, don’t trust RNG (random number generator) and don’t live close to a casino, it’s a format worth checking out.